Souvlaki Shack is a family business established in 1998. We have endeavoured to become leading mobile caterers throughout the years of practice and succeeded winning awards for Best Food & Beverage & Best Small catering outlet at the Royal Melbourne Show. We have promoted our products over the past 12 years at Craft Markets Australia, Formula One Grand prixs, Spring Racing Carnival and many more. Through our premium quality, fresh ingredients and qualified staff we offer that point of difference. We have a well deserved reputation for providing a unique service with style, attention to detail and a cultural eating experience to remember. Souvlaki Shack invites you to taste the Traditional Greek Lamb and Chicken Souvlaki cooked to perfection over natural wood charcoal with fresh salads tsastiki in bbq pita, and for a vegetarian choice, organic falafel wrap. Included in our menu we offer a gourmet chefs breakfast consisting of free range eggs home smoked bacon mushrooms, spinach, avocado and other savoury choices. Other specialty Mediterranean dishes are slow cooked lamb or goat, home made dips, saganaki, calamari, chargrilled prawns, mousaka dolmades and marinated octopus, all cooked fresh on site. We can cater for your function from 70 people to seven hundred, and tailor a menu that works best for you. 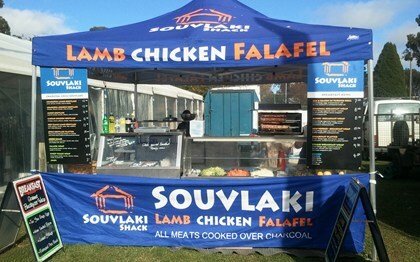 Souvlaki Shack can cater for your parties, corporate functions, christmas parties, school events and music festivals.